Liam Gallagher will make his long-awaited return to the U.S. this May for a U.S. tour in support of his internationally acclaimed debut album, As You Were. 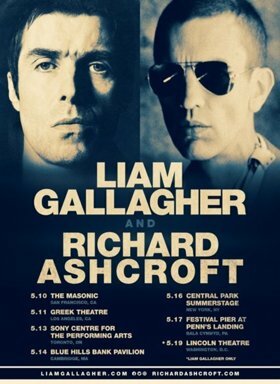 Richard Ashcroft will join forces with Gallagher on all dates except the final show of the tour on May 18 in Washington, D.C. which is a solo show. The tour begins May 10 in San Francisco. In Britain, As You Were topped the U.K. pop charts, has become the fastest-selling vinyl album in the past 20 years and has outsold the rest of the U.K. top 20 releases combined upon release. Now certified platinum in the U.K. and approaching 60 million track streams at Spotify, the album topped the charts in Ireland and claimed Top 10 chart positions in five other countries. Since the album's release, Gallagher was honored with Q Icon and Best Live Act at the Q Awards and NME's prestigious "Godlike Genius" Award.